SCVHistory.com LW2885 | Aircraft Down | 4 Killed in Plane Crash While Searching for Plane Crash, 11-17-1934. All persons on board — prominent pilot Tommy Thomas and three of his employees — are killed when Thomas' Waco Model-C biplane, tail No. NC-13065, crashes against a mountain near Newhall while they were searching for the wreckage of a non-fatal plane crash from 2 days prior. FOUR KILLED IN CALIFORNIA PLANE CRASH. 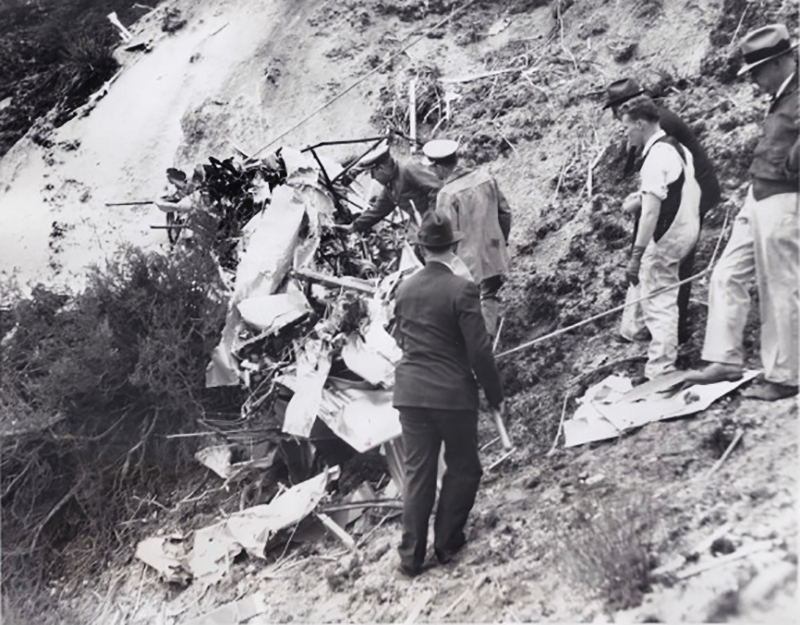 In an ill-fated sightseeing flight to view the wreckage of a mail plane crack-up 36 hours before, three men and a woman were instantly killed when their own craft dashed itself to bits against a fog-hidden hillside near Newhall, Calif. The plane, owned by the Pacific Air Motive Corp., and piloted by W.E. Thomas, president of the concern, apparently hit the face of the hillside with the force of a bullet, and reduced the ship to a tangled mass of wreckage. This photo shows rescue workers searching for bodies in the wreckage. News of [George K. Rice's TWA Northrop Alpha 3A] crash and the rescue of the pilot caused a sensation in the local news media. The owner of Pacific Aeromotive Corporation, W.E. "Tommy" Thomas, decided to take an aerial look at the Alpha wreck. He invited three of his employees to join him aboard his Waco Model-C cabin biplane NC-13065. The Waco departed Burbank on November 17, 1934, in clear weather, but clouds enshrouded the Newhall Pass and the mountains around it. Tommy Thomas was a highly experienced pilot, but in blind flying conditions, it was another story. A witness near the Alpha crash scene reported seeing the Waco descend out of the clouds and crash, disintegrating when it struck Head Gate Mountain near the Los Angeles Aqueduct spillway. Tommy Thomas, Roy W. Kidd, F.M. Matthews and 22-year-old Dorothea Benham died instantly in this accident in which clouds, and not a storm, were a factor. Veteran California Pilot And Three Passengers Killed. Ship, Cruising in Dense Fog, Hits Hillside. 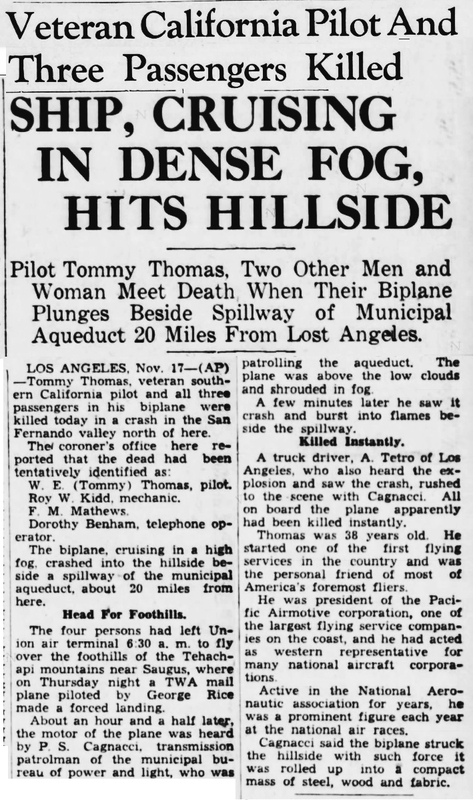 Pilot Tommy Thomas, Two Other Men and Woman Meet Death When Their Biplane Plunges Beside Spillway of Municipal Aqueduct 20 Miles From Los Angeles. The Associated Press | November 17, 1934 | As published in the Lincoln (Neb.) Star. LOS ANGELES. Nov. 17 — (AP) — Tommy Thomas, veteran southern California pilot and all three passengers in his biplane were killed today in a crash in the Fernando valley north of here. The biplane, cruising in a high fog, crashed into the hillside beside a spillway of the municipal aqueduct, about 20 miles from here. 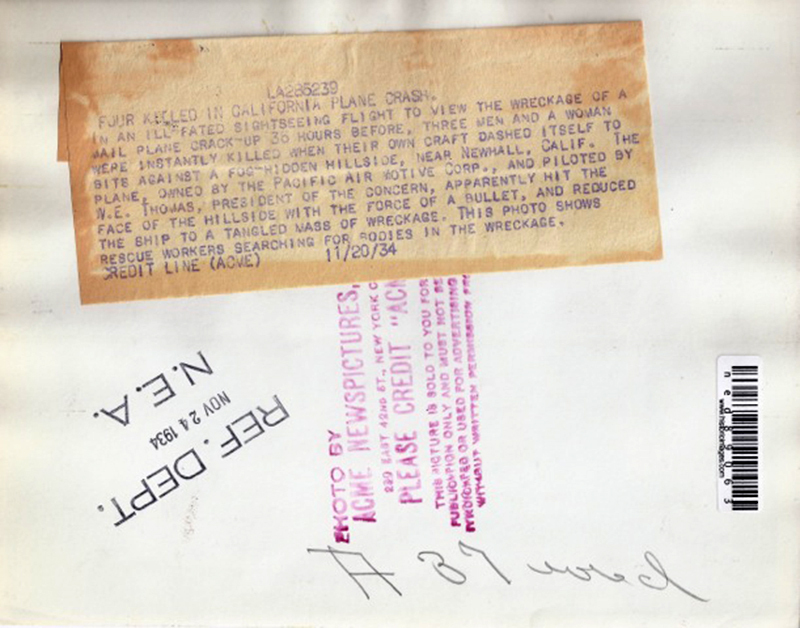 The four persons had left Union air terminal 6:30 a.m. to fly over the foothills of the Tehachapi mountains near Saugus, where on Thursday night a TWA mail plane piloted by George Rice made a forced landing. About an hour and a half later, the motor of the plane was heard by P.S. Cagnacci, transmission patrolman of the municipal bureau of power and light, who was patrolling the aqueduct. The plane was above the low clouds and shrouded in fog. A few minutes later he saw it crash and burst into flames beside the spillway. A truck driver, A. Tetro of Log Angeles, who also heard the explosion and saw the crash, rushed to the scene with Cagnacci. All on board the plane apparently had been killed instantly. Thomas was 38 years old. He started one of the first flying services in the country and was the personal friend of most of America's foremost fliers. He was president of the Pacific Airmotive corporation, one of the largest flying service companies on the coast, and he had acted as western representative for many national aircraft corporations. Active in the National Aeronautic association for years, ha was a prominent figure each year at the national air races. Cagnacci said the biplane struck the hillside with such force it was rolled up into a compact mass of steel, wood and fabric.